Last Mother's Day was by far the sweetest and happiest celebration I had in 12 years as a mom. The kids and the hubby showered me with many priceless gifts. 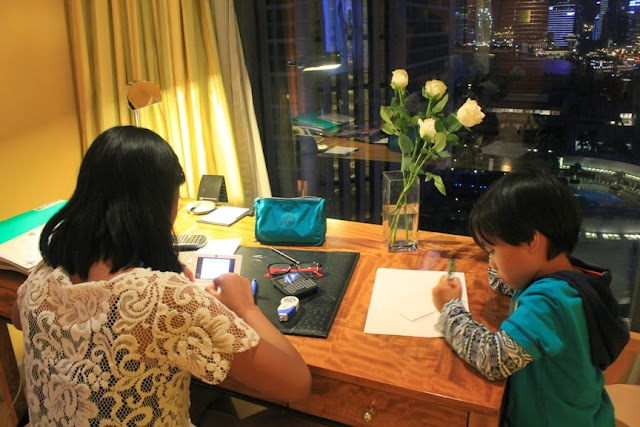 Tightest hugs, sweetest kisses, handmade cards, white roses, Hokkaido cheesecake and a staycation at Conrad Centennial Singapore. I gifted the hubby a staycation at Hard Rock Hotel last Father's Day and he reciprocated. I was over the moon! 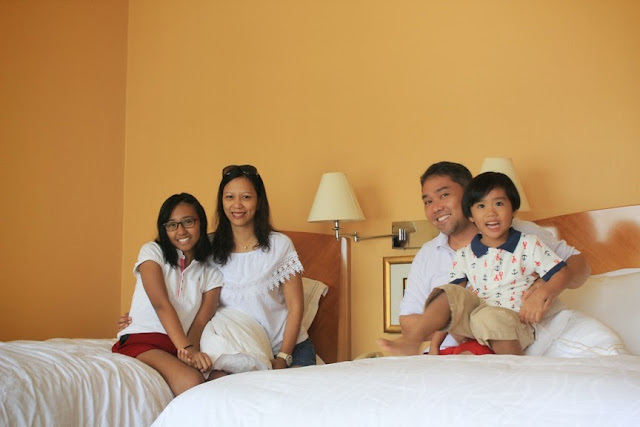 We woke up a little late on Mother's Day eve and it took us a long time to get a taxi so we only arrived at the hotel around 12nn. My boy was so excited to see our "new house" I had to tell him "almost there" everytime he asks are we there yet? 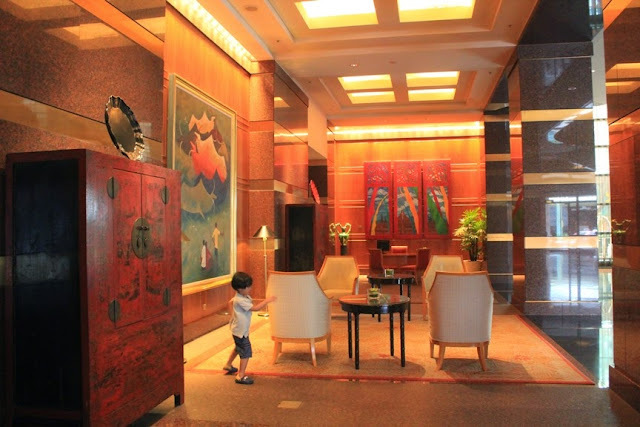 As soon as we entered the hotel premises, he was off exploring whilst big sister K kept herself busy with taking photos in my iPhone. G kept himself entertained whilst we're waiting for the hubby to check in. What a little curious boy he is! Good thing there weren't many people at the lobby otherwise visitors will think it's his first time entering a nice hotel. LOL. 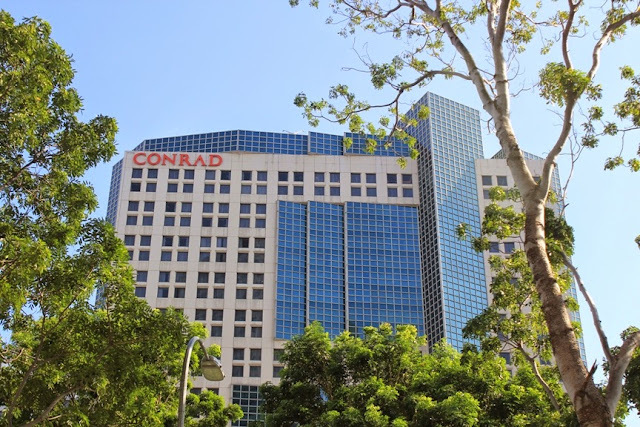 Conrad is actually the 14th (if I counted it accurately) hotel we have stayed in the span of 7 years since we started having staycations and vacations overseas. 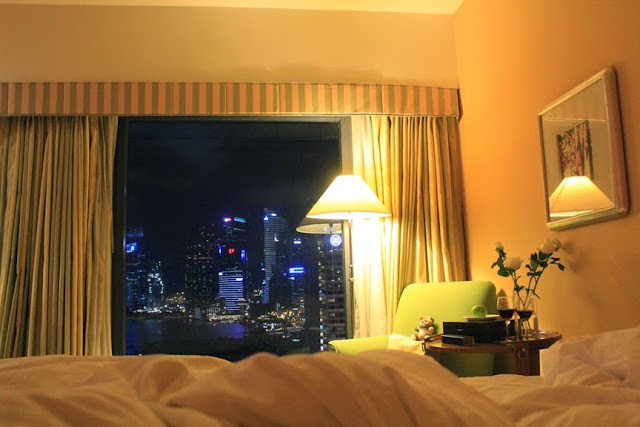 This is the gorgeous city view that greeted us in our hotel room window at the 17th floor. 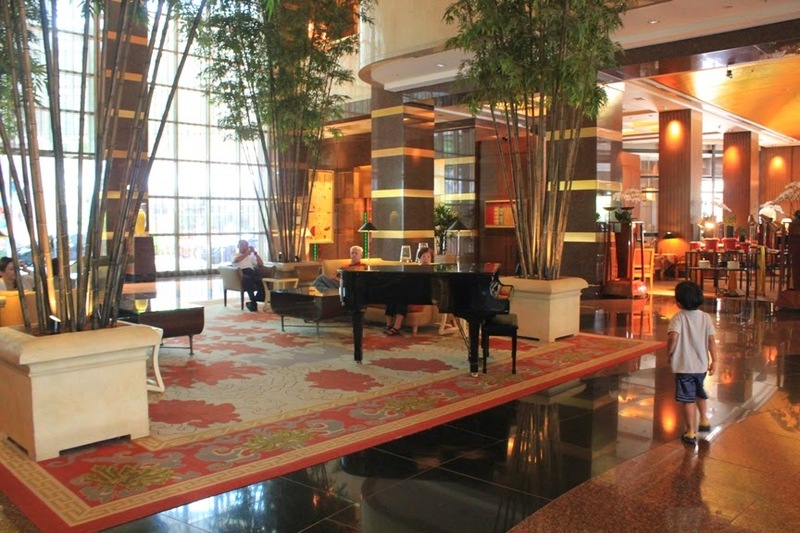 We didn't upgrade to a club floor anymore like what we did at Impiana Hotel when we visited KL last March. I will write a review of the hotel in another post and concentrate on the things we did during our entire staycation. 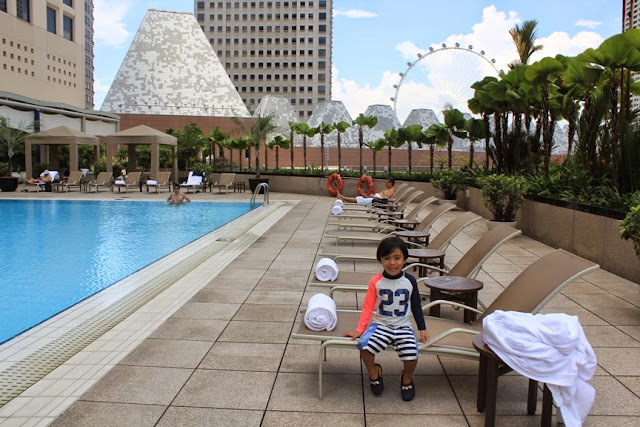 As soon as we settled in our room, the kids begged us to bring them to the hotel swimming pool at Level 4. G shouted, "giant wheel!" when he spotted the Singapore Flyer. It one of his favourite rides in Singapore, along with cable car rides and train rides. That expression on his face can be translated to: "Stop taking pictures of me mom, I want to dive in the swimming pool already!" LOL. 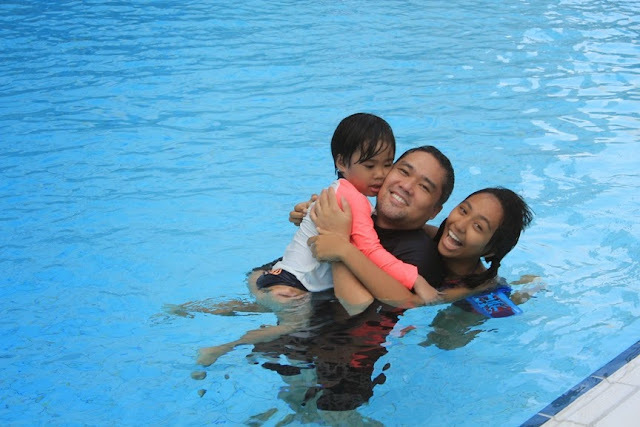 Unfortunately, the pool isn't toddler-friendly but he still had fun time swimming with daddy and Ate K. Looking at these three having fun is the best gift I had for Mother's Day. My strawberry monster took a break to have some strawberry slices and peeled grapes which I brought from our fruit stash at home. We were also given complimentary fruits on a stick and cold water. I just had to "model" it. What a lousy model I am. LOL. 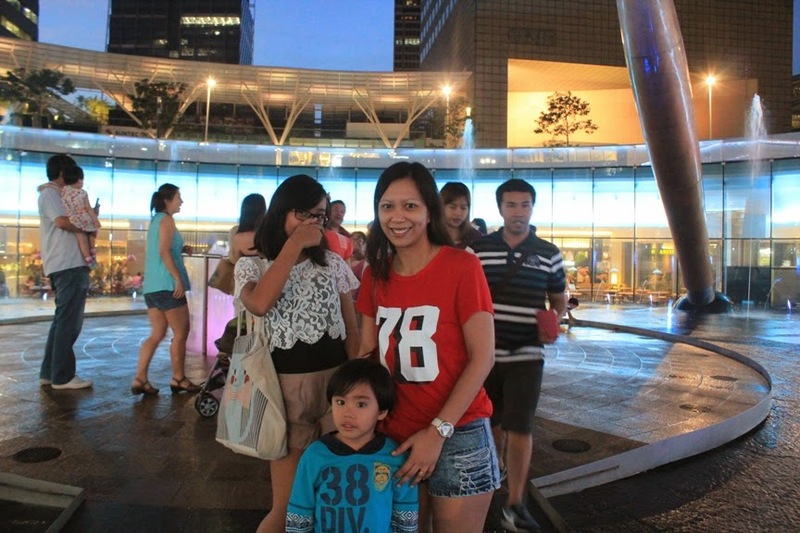 After swimming, we went to check out the Fountain of Wealth at Suntec City. It is actually located right opposite the hotel. We did not manage to go inside as it was closed. 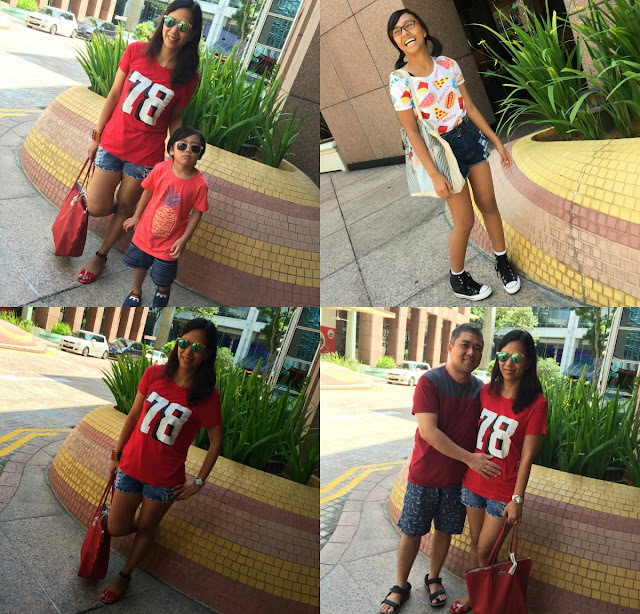 We decided to go to Marina Square Shopping Mall to have lunch. We stopped for OOTD photos on our way. Yes, I am a 1978 baby. K and I were both wearing an H&M shirt and brand-less denim shorts. 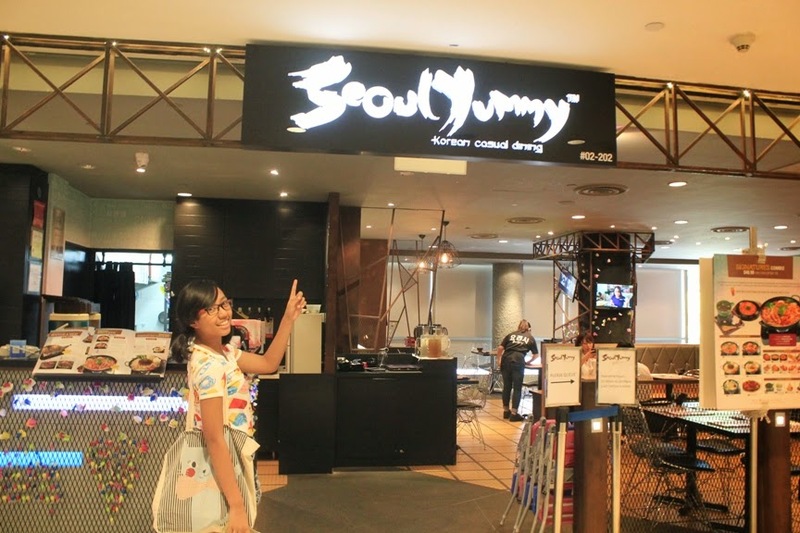 We had no idea what we wanted to eat for lunch so when we spotted Seoul Yummy, my K-Pop fanatic suggested that we give it a try. 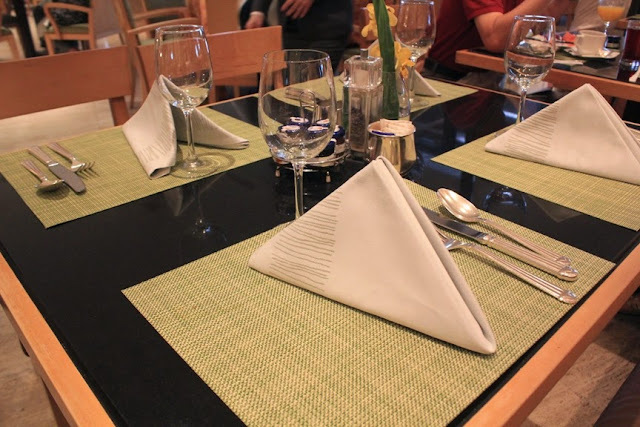 Food and ambiance ain't so bad but we left $100++ poorer. 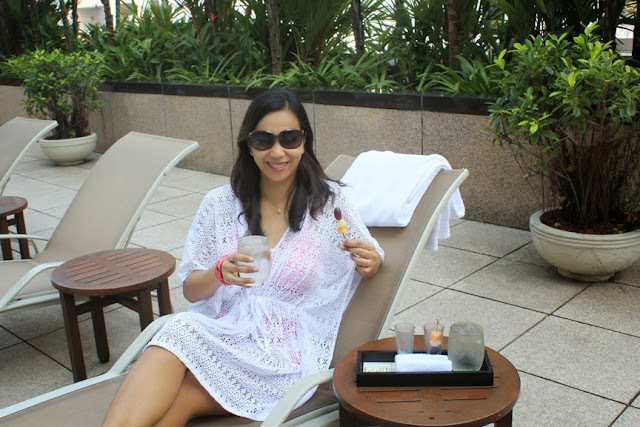 I told the hubby I should have upgraded to a Club Floor instead and availed the tea and cocktail buffet at the hotel. After lunch, we had window shopping and when we got tired we went back to the hotel for a downtime. G and I had so much fun counting the sail boats and bum boats floating at Marina Bay. We spent the rest of the afternoon just watching the beautiful world go by. Came dinnertime, we went back to check out the Fountain of Wealth and we finally managed to go inside and made a circle at the fountain. 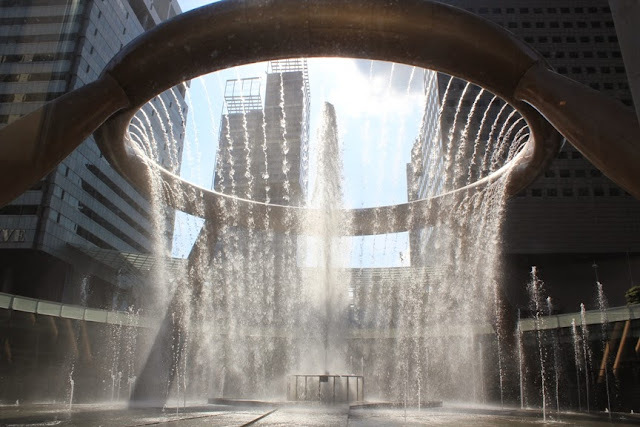 It is believed that when you complete the whole circle whilst touching the water from the fountain, you'll be wealthy! LOL. Ok, I may have made that up but there's a belief similar to it which I can't exactly remember. After we were chased out of the fountain (The guard kept shouting, the water is going to fall! Hurry up or else you all get wet! 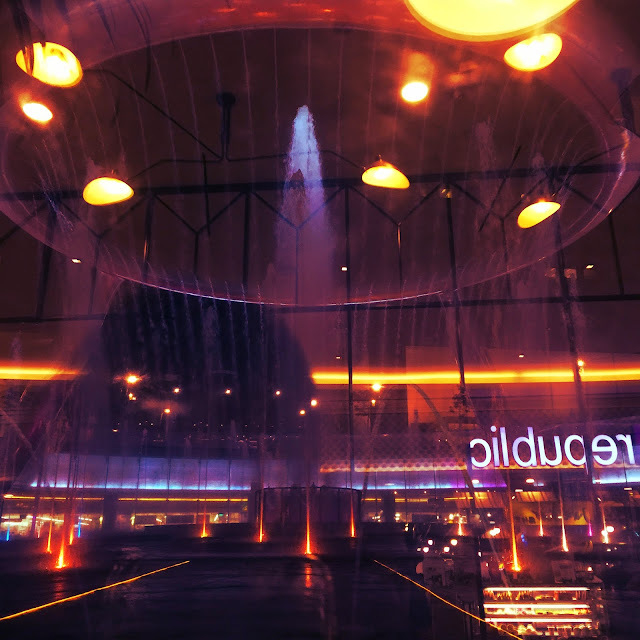 ), we had simple dinner at Food Republic and we ate dessert at Toast Box which had a great view of the fountain just because G wanted to watch the dancing fountain in its full glory, with the changing colourful laser lights and all. His indescribable happiness is worth the extra calories I gained from eating cake for dessert. We didn't stay longer as K had to review for her upcoming exam. Upon seeing his sister busy, he declared he also "wants to be busy" (those were his exact words relayed to me) so I gave him the hotel's letterhead and a pen. He tried his best to write MOM, I Love You, and Happy Mother's Day. Oh my heart! That particular Mother's Day eve is one of the best nights of my life. 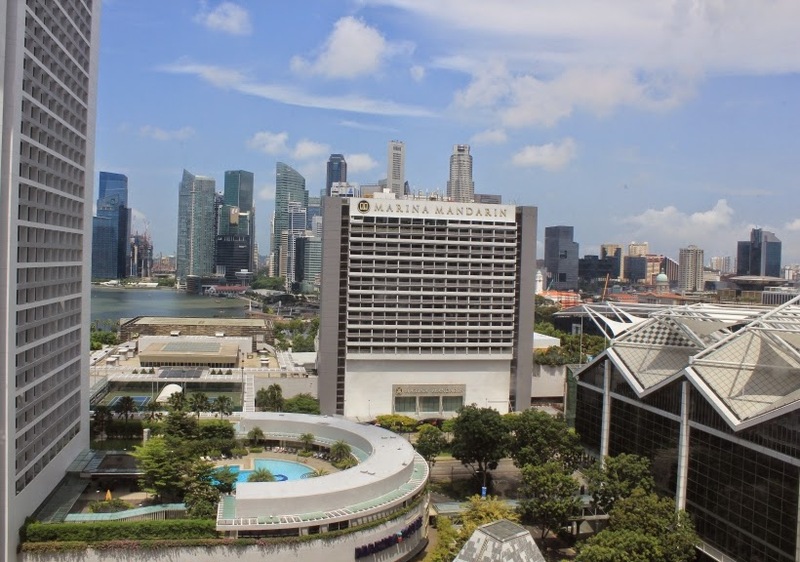 We had the stunning views of the Singapore Skyline on the bed and we even said goodnight to Merlion before hesitantly drawing the curtains closed. On Mother's Day morning, we had a sumptuous breakfast buffet at the Oscar's. I indulged myself with lots and lots of smoked salmon, crispy bacon, eggs benedict and more. As I was trying to finish my epicurean indulgence on a healthy note eating fresh fruits and salad, my boy said "Stop eating mom! See? All people go already. Let's go to the swimming pool!" to my great embarrassment. LOL. Off we went to the pool then. The kids are basically the happiest when in water and I can't be any happier for them. They are the very reason why I was celebrating Mother's Day after all and I am forever grateful that God have entrusted me with these two beautiful children and a thoughtful husband. As always, G continued having water fun at the bathtub. He was kept entertained by Conrad rubber ducky. this happened. LOL. Yes, we are a bunch of crazies. 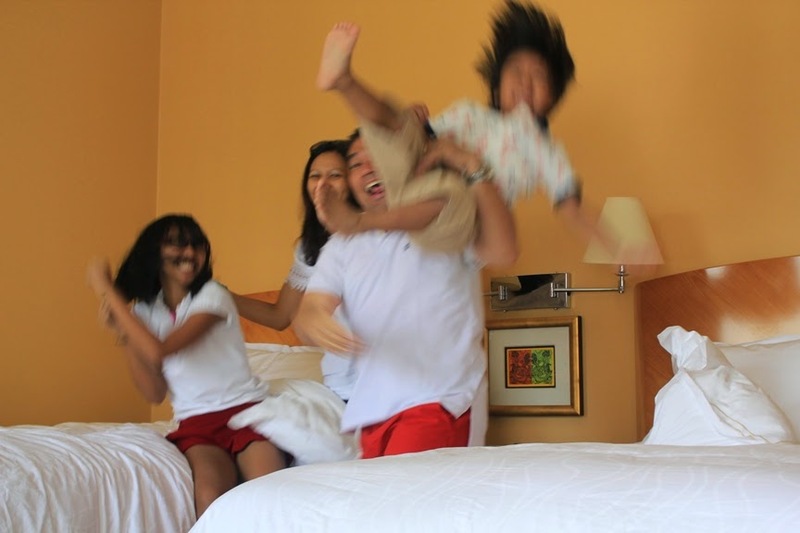 That's how blissfully chaotic our family is and I love it. 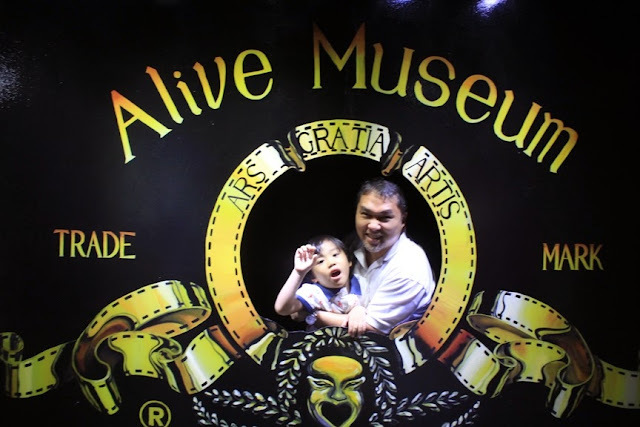 We left our things at the hotel and went to explore Alive Museum at Suntec City. I will blog about it in another post. Thank you for the wonderful memories, Conrad Centennial Singapore! It was a very happy and memorable Mother's Day celebration! My heart is full. To God be the glory! 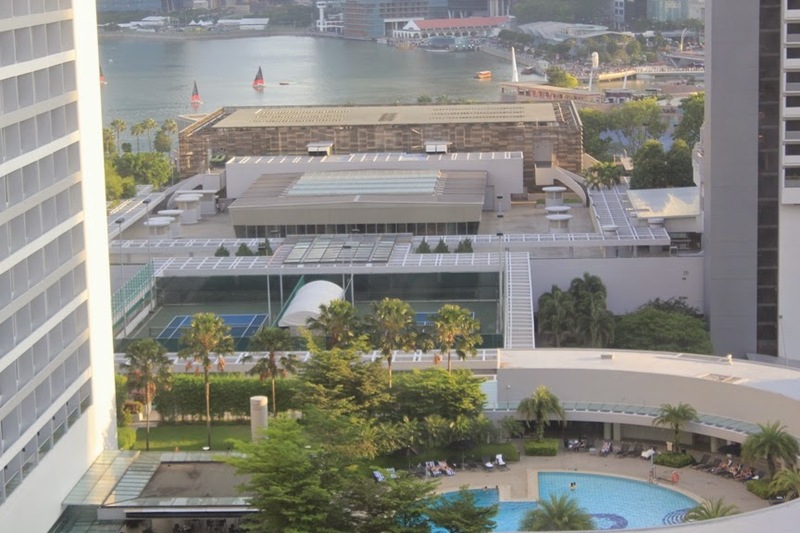 "Located in the heart of Marina Bay, the multi-award winning Conrad Centennial Singapore hotel features world-class business facilities, delectable cuisine and personalized service at every turn." ~ from the hotel website. 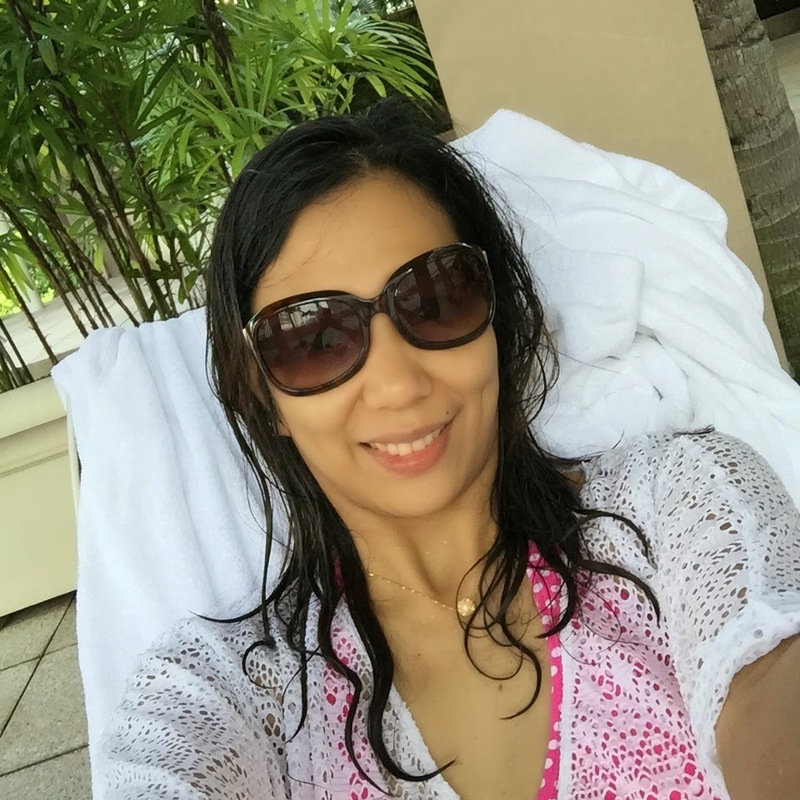 Disclaimer: This is not a sponsored staycation. 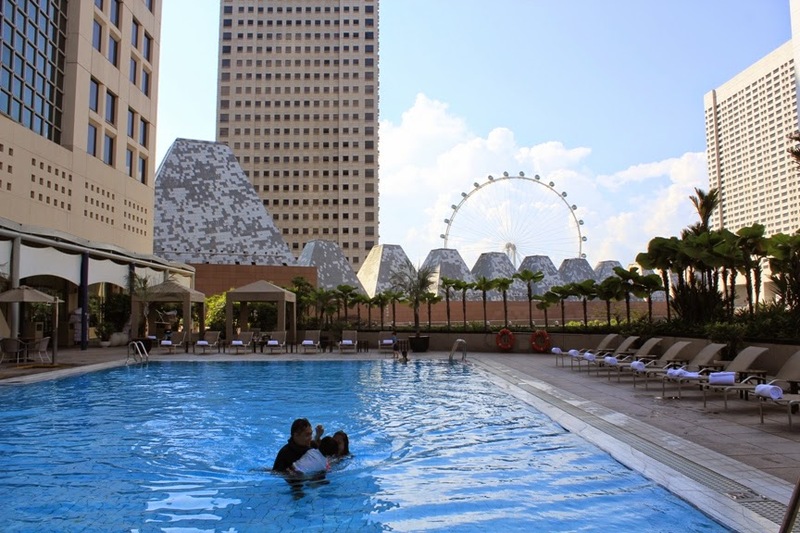 The hubby accumulated massive points from his company phone, availed a stay at Conrad Centennial Hotel and paid for the remaining charges.